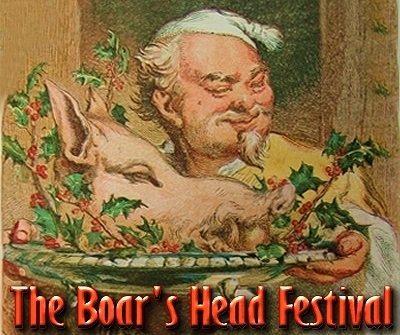 The colorful ceremony of the Boar’s Head has been part of a dinner celebration at Christmas since the Middle Ages in England. This pageant is rooted in ancient times when the boar was sovereign of the forest. A ferocious beast and menace to humans, it was hunted as a public enemy. At Roman feasts, boar was the first dish served. Some scholars also think that the custom goes back to the Norse practice of sacrificing a boar at Yuletide in honor of the god Frey, the god of sunshine who rode across the sky on his golden-bristled boar known as Gulli-Burstin…who was seen as a solar image, with his bristles representing the rays of the sun. Pigs were also sacred to the Celts, who believed they were given as a gift from the Otherworld. Like our Thanksgiving turkey, roasted boar was a staple of medieval banquets. As Christian beliefs overtook pagan customs in Europe, the presentation of a boar’s head at Christmas came to symbolize the triumph of the Christ Child over sin. The Boar’s Head procession was first celebrated in 1340 at Queens College in Oxford University. There is a colorful story of its origin that tells of a student at the college who was attacked on Christmas Day by a wild boar. All he had in his hand to use as a weapon was his copy of Aristotle, so he shoved the book down the boar’s throat, thus choking it to death. Wanting to retrieve his book, the student cut off the animal’s head and brought it back to the college where it was served for Christmas dinner with much pomp and ceremony, finely dressed and garnished, and borne in procession to the dining room, accompanied by carolers singing “in honor of the King of bliss.” The procession of the Boar’s Head is described in one of the first published Christmas carols, the Board’s Head Carol. The festival continues at the College to this day. By 1607, an expansive ceremony was in use at St. John’s College, Cambridge, England. There, the boar’s head was accompanied by “mustard for the eating” and decorated with flags and sprigs of evergreen, bay rosemary and holly. It was carried in state to the strains of the Boar’s Head carol. Today the Boar’s Head Festival is celebrated in various places, including many different churches around the country. Yet, in spite of its modern-day Christian connotations, it is not hard to believe that an older ceremony lies behind this tradition, perhaps an ancient sacrificial event… and that as we sing this old song and partake of the procession, we should remember the great boars of the Solstice. Perhaps one should leave a little offering at the back door in their memory, such as an apple or orange… one never knows if the bristled one might pass by and enjoy such a treat! But I have to agree that I think I would rather enjoy a ham over a head myself!